Your first Business Process Management (BPM) project is a crucial first step on your BPM journey. It is important to begin this journey with a philosophy of change that allows you to avoid common pitfalls that lead to failed BPM projects, and ultimately, poor BPM adoption. 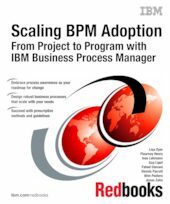 This IBM® Redbooks® publication describes the methodology and best practices that lead to a successful project and how to use that success to scale to enterprise-wide BPM adoption. This updated edition contains a new chapter on planning a BPM project. The intended audience for this book includes all people who participate in the discovery, planning, delivery, deployment, and continuous improvement activities for a business process. These roles include process owners, process participants, subject matter experts (SMEs) from the operational business, and technologists responsible for delivery, including BPM analysts, BPM solution architects, BPM administrators, and BPM developers.